Summer has (finally!) arrived. Weather is warmer, people seem happier and outdoor activities are on the rise. It makes us wonder – with the shift of lifestyles between seasons, what do advertisers do to adjust and reach consumers? Most summer ads for Alcohol, Food & Beverages feature plain, regular or blocky typographic styles. The frequency of Travel & Entertainment advertising is consistent despite the season, BUT people are twice as likely to book a vacation during the summer months. Over half of the ads in summer are primarily Red or Blue. Charities and Nonprofits are the least active in the summer. Meanwhile, Technology ads spike in the summer. 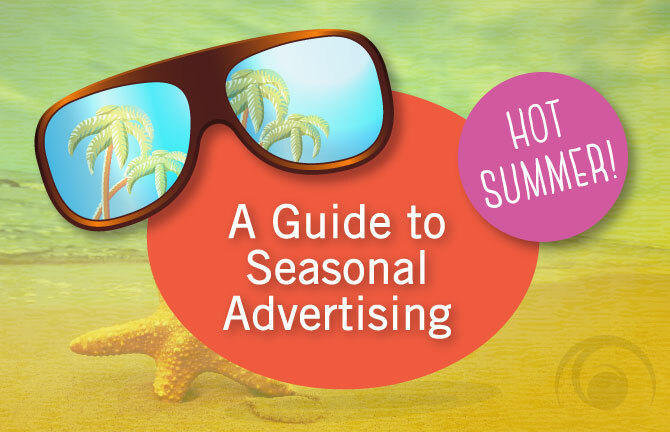 The take away: stand out from the crowd while advertising during the summer months. A big factor in success is grabbing a consumer’s attention, so why not try making a joke while promoting your latest sale or experiment with a new typeface (but not Comic Sans, we beg you!!)? In terms of Media, how are the channels of advertising affected? Is there a decrease in television advertising? Or an increase in web browsing? How does that affect a mobile campaign? The truth is – it depends! Television programs like Good Morning America, the Today Show, local & national news as well as soap operas never rerun an episode because there is a high chance of the audience staying true all year long. In a study conducted by marketingland.com, weekday usage of smartphones and tablets is higher than on weekends for both winter AND summer. However, it seems that tablet use declines in the summer whereas smartphone use increases because people tend to be ‘out and about’. Oddly enough, the Summer/Winter shift doesn’t have a huge impact on mobile campaigns, as users can grab wifi from nearly everywhere – whether it be the ski lodge or the boardwalk. However, advertisers should consider the time of day that consumers are most active on social media. Mobile use dips in the early morning but rebounds later in the afternoon (hello lunch break!) and in the early evening. So be sure to launch your advertising during these peak hours for a better chance at a successful click-through rate and social campaign. So although the seasons change, people don’t have a huge shift in the way that they consume information. People tend to have web access anywhere, so make it worth their while to keep their phones close. But by catering your message to the season, consumers will feel more connected to you because you’re addressing their current wants and needs. So get out there and get grilling – and don’t forget to follow the Array blogs!